This Rare Silkscreen is an absolute must for a serious Collector. Number 196 of 275. “Dancer For Money” was inspired like many of Vettriano’s artwork, by the Tina Turner song “Private Dancer. He took other inspirations from songwriters, such as Leonard Cohen and Johnny Cash. In September 2018, another smaller format run of this image was released, with only 59 Limited Editions and 4 Artist’s Proofs. 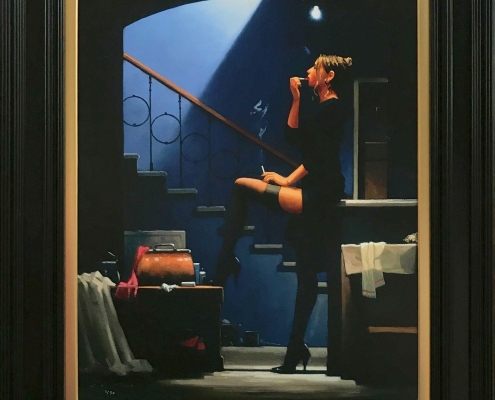 As one of the foremost Vettriano specialists in the U.K. Jack’s Gallery has one remaining Artist’s Proof No V/V and one Limited Edition of this run also. In addition the Gallery stocks many more Vettriano Artist’s and Studio Proofs, and Limited Editions. We also stock a huge range of Open Prints of his Artwork. Please come in and browse or feel free to phone us for further information.